Correspondent and Batticaloa Group The sluice gates of several reservoirs were opened yesterday as unrelenting rains continued to lash the catchment areas. 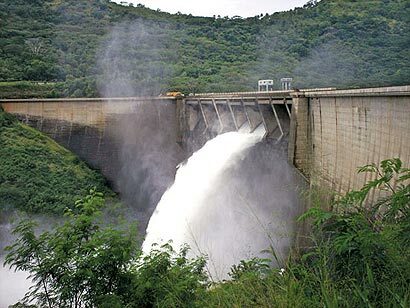 Officials said sluice gates of the Victoria, Castlereagh, Laxapana, Rajanganaya and Wimalasurendra reservoirs were opened due to the heavy rains. They cautioned the public to remain alert. Meanwhile, the Met Department said that showers and thundershowers would continue in most parts of the country in the coming few days. Colombo recorded the highest rainfall of 116 mm during the past 24-hours. Railway sources said that Up-country train services were disrupted due to large boulders falling onto the rail tracks. Trains from Colombo to Up-country areas had to be temporarily suspended at Rambukkana. However railway authorities said that the tracks would be cleared and the normal services would continue at the soonest possible. Meanwhile disaster Management Centre said that over 60,000 people throughout the country were affected due to bad weather. As of yesterday over 4000 people had sought refuge in temporary shelters. During the past two weeks three lives too had been lost due to floods and earth slips. The Meteorology Department said that under the influence of atmospheric disturbances showery and windy weather will continue over the country. The rains would be severe especially over the eastern and northern parts and over sea areas around the island, they added. Showers accompanied by thunder will develop over most parts of the country during the afternoon and night, they said. Reports from Anuradhapura said that nearly 1,600 small and medium scale tanks in the district were at spill level. Some of them were reported to be overflowing. Several gates of Nachchaduwa and Nuwarawewa tanks were opened yesterday after many years. Extensive damage to crops too had been reported. Meanwhile Batticaloa town has experienced a record rainfall of 90.6 mm during the last 24 hours. As a result many roads leading to the town was inundated yesterday. Floods too has been reported from several areas.